The poet Kalidas writes about the scenic charm of the place in his epics Meghdootam and Sakuntalam. R.A. Strendale's "Camp in the Satpura Hills" draws a vivid pen picture of this idyllic paradise - as does Forsyth's "Highlands of Central India". The popular fictional works of Rudyard Kipling, The Jungle Book and The Second Jungle Book also have their stories set around this region. The Pench National Park is four different forest regions in one, an extravagance of trees, shrubs grasses, climbers, weeds and herbs, with teak being the most prominent of the tree species. The park is home to 33 species of mammals, 164 species of birds, 50 species of fish, 10 species of amphibians, 30 species of reptiles, and a wide variety of insect life. Here, birdlife is equally bountiful. The feathered denizens of Pench include both resident and migratory birds like Malabar pied hornbills, Indian pittas, ospreys, grey-headed fishing eagles, white-eyed buzzards, storks, waterfowls, four endangered vulture species, and the green pigeon, which is the State Bird. 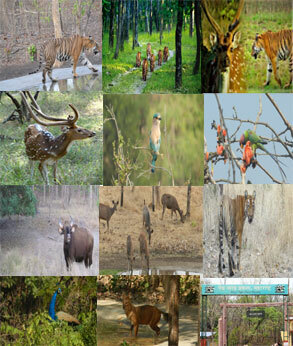 Pench is one of the topmost destinations for wildlife tourism in Maharashtra, albeit a little less famous and popular than the other star attractions i.e. Tadoba in Chandrapur district of Maharashtra. Much like the system of wildlife tourism in most of India, the tourism activity in Pench Tiger Reserve is restricted to 20% of the core area and is carried out through safari drives done each day in the morning and evening. The number of jeeps that are allowed entry into the reserve is restricted by the Forest Department.